This plastic seat, mounted on the inside of the toilet partition, either on the door or panel, allows a parent to take a toddler into the stall with them. Unit supports a static load of 50 lbs (23 kg). Open unit folds to 5-1/2″ (140) when seat is manually lifted to close for storage, and requires less than 1.9 ft² (1765 cm²) of wall space either open or closed. High-density polyethylene is easy to clean and resists fungal and bacterial growth. 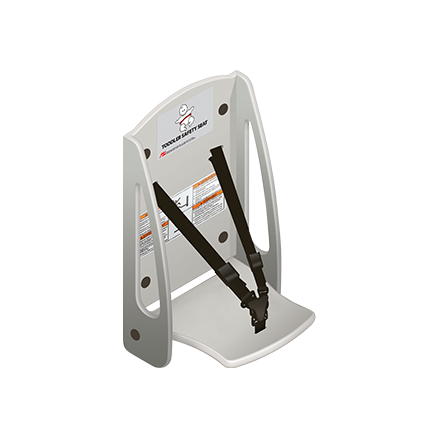 Toddler Safety Seat can support static loads of 50 lbs (22.7 kg). Unit is operable with one hand with less than 5 lbs (22.2N) of force while not requiring any tight grasping, pinching, or twisting of the wrist. Safety harness is easily adjustable by user for any baby size and latch securely resists opening until released by opposing finger pressure by adult caretaker/parent. Each side shoulder strap is independently attached to the belt clasp to avail user of simple and secure engagement without having to lift a loop strap over the baby’s head. User should always attend baby at all times.